RoyalEnfields.com: Why do people sell low mileage Royal Enfields? Why do people sell low mileage Royal Enfields? 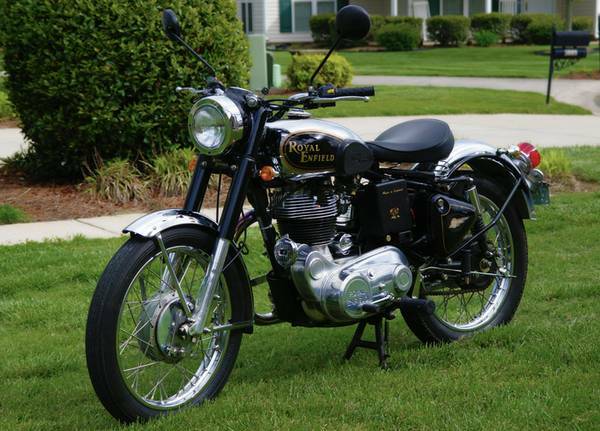 Royal Enfields remind us what motorcycles were like when we were young. "I seem to recall there was a thread regarding the number of relatively new Royal Enfields for sale with less than 2,000 miles. What I would like to read about or know about is why it seems there are so many for sale like that. What changes a buyer's mind after they buy it to the extent they no longer want it?" I might be the wrong person to ask: I've had my Bullet for 12 years and 40,000 miles. But let's think about it. First, I don't know for sure that a greater percentage of newish used Royal Enfields are available with low mileage than any other brand. "How many total miles have you ridden your street motorcycle(s) in the past 12 months?" That's one question the Oregon Department of Transportation asked 835 motorcycle riders in a 2012 survey. The mean number of miles Oregon motorcyclists claimed to ride: 3,708 miles a year. Thirty-four percent claimed to ride 1,000 miles or less a year. That's going to create a lot of "relatively new" low mileage motorcycles of all brands. "Purchased for my father at a local auction so that he could relive his childhood — he got over it fairly quickly." Royal Enfield in the U.S. is definitely a retro product, with powerful classic appeal. I think it's apparent that guys my age (63) who want to be reminded of motorcycles from the 1950s are slowing down. We don't ride as much as we used to; low mileage results. "The population of motorcycle buyers is aging, with the average rider age increasing from 40 to 49 years since 2001 — an indication that many owners may soon exit the market. Additionally, the percentage of first-time buyers has declined for a second consecutive year, making it more critical now than ever for manufacturers to focus on attracting new customers." Royal Enfield is doing that. Its new models are improved in performance and ease of maintenance (same classic looks) and come in an ever wider array of models. Classic looks can appeal to young as well as older riders. And new excitement is coming, too, with the Continental GT cafe racer. I've noticed for years that motorcycles for sale seem to have either 4000 or 8000 miles on them, except for V-Stroms, Gold Wings, and sport-tourers. Cruisers and sportbikes are often bought by people who are only going to ride them on weekends, and it turns out that they don't make the time to do that. I'm over 9000 on my RE now, 20 months in. I'm at that "am I really going to ride in the summer?" stage right now, trying to talk myself into it. Last summer it sat in the shop, so I had a good excuse. A few more weeks, though, and I'll probably decide it's just too hot, and use the car mostly until late September or early October. 38 degrees I can handle. 98? No thanks. Anyway, for most bikes, the reason they don't accumulate miles is that they aren't used for commuting nor for vacationing. Most boats don't see a lot of use, either. Since I prompted the question I guess I should weigh in. I think in my case you have the right answers. I waited and waited for RE to arrive in California and then when I test rode a C5 I also test rode a Triumph T100. I was seduced by the looks, quality, and power so I bought the T100. I was 64 then and remembering Bonnevilles and BSAs of the 1960s. I was also forgetting that they weighed a 100 pounds less. I pretty much got comfortable on the T100, but it was nothing like the 60s: no helmut, no gloves, jump on and go! After 3 years I only have about 2100 miles and I have drifted away from it although i looks great in my garage. I still like the idea of riding and have been thinking of selling the T100 and getting the new RE B5 with the idea it is lighter and easier. This is a bug that bites me every few years and I guess I am now ready to be seduced again. Once I can find a dealer with a B5 I will go for a test ride with a different and I hope a wiser mindset. In the meantime I will haunt your blog. It may just get me though the current bout of motorcycle desire. Thank you for a great question and a great response. Keep us posted. Will - You may not need this reminder, but keep in mind that if you test ride a new RE with just a few miles, it won't be broken in and it won't ride at all like a grown-up RE. It becomes a completely different ride after 1K or so miles under its belt. Interesting that Alan is wondering about whether to ride in the summer, whereas I've been itching for it! Texas and Maine are two different worlds, in may ways I suppose. But at least we both ride a B5!! Excellent point about the break-in.